The VDC Control Centre is the interface to Interoute Virtual Data Centre where you create and manage the resources of your own Virtual Data Centre. It is accessed through a web browser and should work with any Internet connection and a recent version of any of the major browsers. If you see any scrambled layout of the interface it is usually advisable to do a 'hard refresh' of your browser cache (by pressing the keys Ctrl and F5 together). You can access the Control Centre from the My Services portal http://myservices.interoute.com. Click the Products menu and select VDC 2.0. Alternatively, use the 'VDC 2.0' tile by clicking its 'VDC 2.0' title at the top left corner to open the VDC Control Centre window. If the tile is not open on your dashboard, click Add tile at the bottom of the window and choose VDC 2.0. The VDC 2.0 tile, and similarly the region-specific tiles 'VDC 2.0 Europe' etc, contain indicator dials to show the current resource usage: CPU, RAM, storage, and number of VMs. Interoute Object Storage is an independent storage platform which offers resilient, scalable storage to complement the storage types available in VDC. You can access the user interface via the Object Storage button in the VDC 2.0 window, as shown above. For more information, see Object Storage documentation. In the VDC 2.0 window there are separate tabs to access the separate VDC Control Centres for the three VDC regions: VDC Europe, VDC Asia and VDC North America. Your VDC account should allow you to access all of the regions. However, the free trial account does not include access to VDC Asia. Resources located within one region are only visible from the VDC Control Centre of that region. You can use a Direct Connect Group and Private Direct Connect networks to create private inter-connections between virtual machines in different regions. When you log in, you will always be shown the Dashboard panel, as in the screenshot above. You can return to the Dashboard view at any time by clicking Dashboard in the left-hand menu. Please note that the Dashboard appearance is not modifiable. The Virtual machines sub-panel shows the number of ‘Running’ and ‘Stopped’ VMs. Any difference between the sum of these numbers and the number of 'Total VMs' will correspond to VMs which are in other states such as 'Starting', 'Stopping', 'Destroyed' or 'Expunged'. The Latest events sub-panel shows the most recent items from the Events log. Click ViewAll to open the Events panel. The Network sub-panel shows the number of isolated-type networks and public IP addresses currently in use. Click ViewAll to open the Network panel. 'Isolated' networks are also known as 'Local' networks, see How to create a network for your VDC. A stopped VM is being held in a paused state and its allocated resources (CPU, RAM, disk) will still be charged for, as well as for any additional storage that is being used for snapshots. Click Virtual Machines in the left-hand menu to open the virtual machines panel. This panel is where you can deploy (create) a new virtual machine, check the status of your VMs, start/stop or re-configure a VM, access a VM console, or perform operations such as making a snapshot of a VM. The list of VMs shows the VM Name, Display Name (descriptive text about the VM, which you can insert when the VM is deployed, or edit later), VDC Zone where it is deployed, and the VM state (Running, Stopped, Creating, Expunging, etc). If you click one of the column headings you can change the ordering of the listed items. Also you can filter the list of VMs displayed by typing into the search box a string of characters that will match any part of a VM name. To create a new VM, click Add Virtual Machine. This procedure is described in How to create a virtual machine. Stop the VM. If a VM is stopped, this button becomes 'start VM'. Take a snapshot of the VM (note: this is a hypervisor-level snapshot, which cannot be guaranteed for the recovery of application-consistent data if the application is running when a snapshot is taken). Attach an ISO to the VM. If an ISO is attached, this button becomes 'detach ISO'. Reset the (Administrator/root) password for the VM. The VM must be stopped for a password reset. The new password appears in a dialog box. Note: password reset is not available for a VM which is only connected to a network of type 'Local Private' because it requires a virtual router in the network, which is not present. Change the service offering for the VM: change the compute offering (the RAM and the number of CPUs); it is possible to do dynamic scaling of a running VM if the correct hypervisor utility software (e.g. VMware tools) is installed in the VM template. Underneath the task bar there are three arrow-shaped buttons View Volumes, View Snapshots and View Affinity Groups which will display the resources of these types that are attached to or associated with this VM. See below for more information about controlling these resources. A NIC (Network Interface Controller) is a 'virtual device' attached to the VM which enables the connection of the VM to a network. Each VM may have multiple NICs and network connections simultaneously. One of the NICs is always set as 'Default'. To add a NIC/network to the VM, click the Add network to VM button, and select the required network in the dialog box. For each item in the list of current NICs, the network name and ID are shown, and the internal IP Address of this VM in the network. For a NIC which is not the default, you can use the 'tick' button to set it as the default, or the 'cross' button to delete the NIC. If you change the default network, this is not automatically communicated to the VM operating system, so you may also need to change the network routing configuration inside the operating system to get the correct routing behaviour. At least one NIC must be connected to a VM at all times. Use the Networks panel (see below) to see details of the networks themselves (including public IP addresses) and to change their configurations. The Statistics tab shows summary statistics about the CPU, network and storage utilisation of the VM. Only the 'Total CPU' and 'CPU Utilized' statistics are currently enabled. In this panel you can create and edit 'anti-affinity' groups for your VMs. VMs in the same anti-affinity group will not run on the same compute hardware, and will be automatically distributed across independent processing units. This makes it easier to build a (locally) resilient solution using multiple VMs. See the document How to use affinity groups to create resilient VM solutions. Use the Select view dropdown to select whether Volumes or Snapshots are displayed. Volumes are disks that can be attached to a VM. There are two types of volume associated with a VM: 'rootdisk' volumes and 'datadisk' volumes. The former is the disk where the VM operating system is located, that is the ‘root disk’ (for Linux) or 'C: drive' (for Windows). Normally, you do not specify a size for the root disk as this is determined from the template used to create the VM; the standard size for Linux is 10 GBytes, and for Windows, 60 GBytes or 100 GBytes. The exception to this is when you create a VM from an ISO image file, which requires a root disk size to be specified (see How to create a VM by booting from an ISO). It is recommended not to use the root disk to hold application or user data, and the root disk is deployed at a minimal size sufficient to accommodate only the operating system and essential applications software. The root disk can be resized at any time if more space is required; the VM should preferably be stopped for the resizing. EBS: Magnetic disk block storage that is 'unprotected' (no snapshot copies). EBS SSD: SSD block storage that is 'unprotected' (no snapshot copies). EBS Protected: EBS with regularly-captured snapshots stored in the same VDC zone. EBS SSD Protected: EBS SSD with regularly-captured snapshots stored in the same VDC zone. EBS Mirrored: regularly-captured snapshots are stored in the same zone and copied (mirrored) to another VDC zone. All of these different types of storage will be seen identically by the VM operating system as block storage (the OS has no awareness of the physical medium, or snapshot protection). A new storage volume needs to be partitioned and formatted by the VM operating system before it can be used. There are more specialised storage options available in VDC, such as Interoute Scalable Storage (also known as vFiler). To create a new volume, click the Add Volume button. This procedure is described in the document How to add a volume to your VM. A root disk volume cannot be detached from its host VM. If you click View Snapshots you will see a list of the stored snapshots for the selected volume. Snapshots are instantaneous copies of storage volumes, captured by the VDC hypervisor software. Snapshots can be used to copy volumes, and to create templates for deploying virtual machines. For backup and recovery purposes, volume snapshots are useful to provide a rapid recovery mechanism for the most recent data in a volume. Because each snapshot consumes storage space equal to the entire original disk, the storage costs are expensive and volume snapshots are not recommended for storing mutiple backups of data. A convenient way to use snapshots is to create a recurring snapshot policy which only retains the most recent (one or two) snapshots and automatically deletes any older snapshots. Snapshots cannot be guaranteed to capture application data in a complete or usable state, if an application is executing at the moment when the snapshot is taken. For manual snapshots, it is best to stop the virtual machine prior to taking the snapshot. The Network panel shows the virtual networks and Direct Connect Groups (DCGs) in your Virtual Data Centre. Use the Select view dropdown to select whether 'Networks' or 'Direct connect groups' are displayed. The Network Map button produces a diagram visualisation of the networks in a VDC account. For details, see VDC network map. Four types of network can be deployed in VDC. There are no charges for setup of any of these networks, or for any data transfers through the network. 'Local with Internet Gateway' is a network with Internet connection (public IP address) and related services for firewall, NAT (port forwarding), load balancing and IPSEC VPN. 'Private Direct Connect' networks (also known as 'MPLS IPVPN networks') use Interoute's global fibre network to offer fast and high-capacity networks which can inter-connect your VMs in any of the VDC zones. Each Private Direct Connect network (within one zone) must belong to a Direct Connect Group, which enables the inter-connection between the zones. 'Public Direct Connect' networks provide a subnet of public IP addresses that are directly accessible from the Internet. 'Local Private' network is a network with no Internet connection or services. VDC networks are explained in the document How to create a network for your VDC. To create a new network, click the Add Network button. For information about a network, click its Identifier name. This will open a panel with two tabs: Details shows the information for the network. For 'Local with Internet Gateway' networks, an Egress rules tab to view and modify the firewall egress rules for the network, and click View IP Addresses at the top right of the panel to access firewall ingress, NAT port forwarding and load balancing functions for the network. You can attach multiple public IP addresses to an Internet Gateway network, and create different NAT port forwarding and load balancing configurations for each address. The Quick links buttons which appear for 'Internet Gateway' networks provide quick access to editing the network properties, and the load balancing, firewall (ingress), and port forwarding configurations. Delete the network (usable for Local Gateway and Local Private networks; the network must be empty of virtual machines for deletion to be possible; note that no restoration is possible after deletion). To create a new Direct Connect Group, click the + Add Direct Connect Group button. Click the name of a Direct Connect Group to view its details. The name of the DCG can be changed by clicking the Edit button. Inside the details view, the Networks field lists the UUIDs of the networks that are members of this DCG. The Templates panel shows the templates or ISOs available for use in your virtual data centre. The Select view dropdown switches between showing the list of templates or the list of ISOs. You can use the search text box to find templates or ISOs with names containing a specified string of characters. Templates (and ISOs) can be created and owned by yourself, or provided by Interoute. Use the Filter by dropdown to switch between Mine for viewing your own templates, or Featured (also Community) for viewing the templates provided by Interoute. You can upload a new template by clicking the Add Template button, or (in the ISO view) click the Register ISO button to upload a new ISO. Click the name of a template to see its details. In the list of templates, you can change the order of listing using the buttons in the Order column. The details view for a template is split into a Details tab, and a Zones tab showing the VDC zones where this template is available to use. 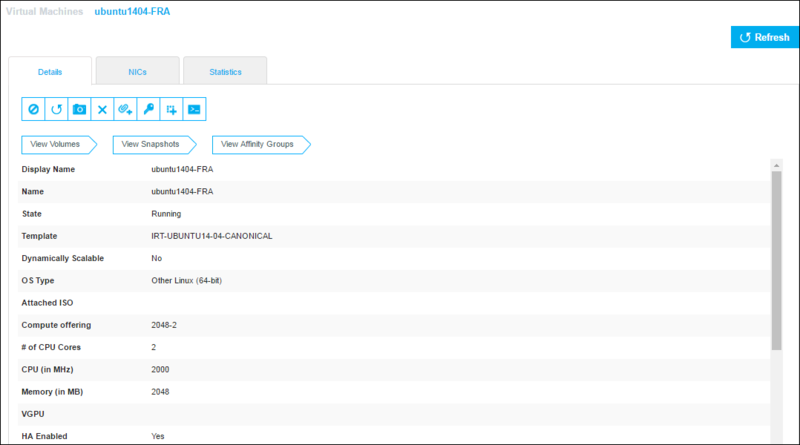 The View Virtual Machines button will show a list of virtual machines that have been deployed from that template. Click the Zones tab to show the VDC zones where this template is available to use. For a template in a zone to be usable, its Ready value should be 'Yes', as shown in the screenshot above. Note that when you upload a template (or ISO) it may take several minutes for the upload data transfer to complete. A deployed VM operates independently of its source template, so you are not required to keep the original template, in every zone that you have used it (every copy of a template consumes storage space and this is always charged for). Click on a zone name to show the details of the template copy in the zone. For templates of type 'Mine', you will see a Delete button to delete it, and a Copy button to copy it to a different zone. These buttons do not appear for the other template categories. Click the name of an ISO to see its details. The views and control buttons are the same as for Templates above. For an ISO in a zone to be usable, its Ready value should be 'Yes'. A deployed VM operates independently of its source ISO, so you are not required to keep the original ISO, in every zone that you have used it (every copy of an ISO consumes storage space and this is always charged for). The Events panel provides access to the event messages generated by your Virtual Data Centre. There are three levels of severity: information (INFO), warning (WARN), and error (ERROR). Click the Event description to see the full contents of the event. You can use the search text box to find events containing a specified string of characters.